If you’re familiar with this blog, you know how much we love quinoa. We already made bread, patties, soup, frittata, more patties, salad and tabbouleh with quinoa. Apparently, quinoa fits in almost any dish we’re cooking. Which got me thinking...maybe I should change the name of the blog from “TheIronYou” to “TheIronQuinoa” or “TheQuinoaYou”. Doesn’t sound bad, at all. I’ll give it a thought. In the meantime (I’m still debating with myself whether changing the name or not) I’m making an awesome casserole with quinoa. 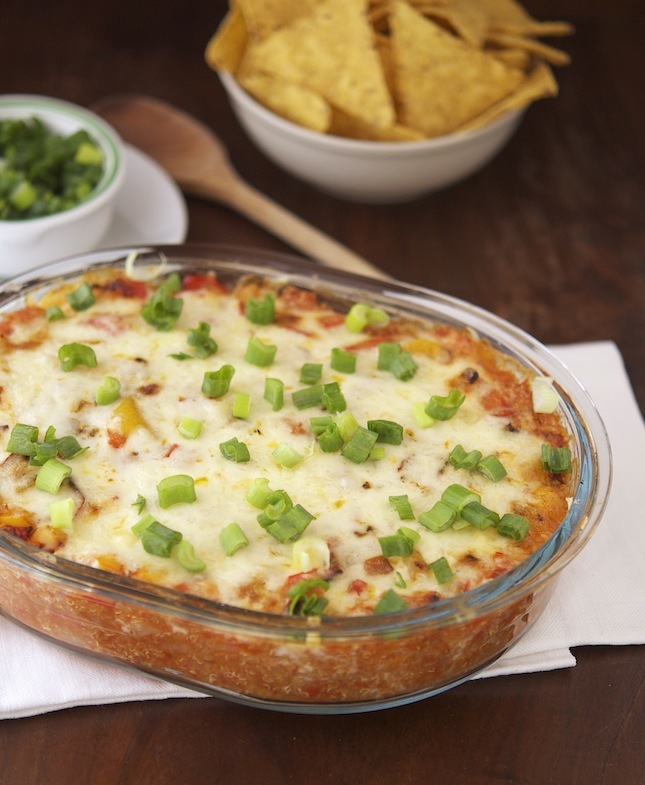 Lots of spices, lots of veggies, lots of quinoa and a bit of oozing cheese to make you crave. Awesomeness. Basically this is your classic Mexican Turkey (or Chicken) Casserole, minus the meat, plus the quinoa. No joke. Let’s not forget that quinoa is arguably the best plant-based source of protein. It includes all 9 essential amino acids in adequate quantities. So there’s no missing the meat over here. If you’re not very fond of quinoa (and you should ask yourself why), this casserole is a good way to hide and make yourself enjoy it. Trust. The folks over at Corazonas recently contacted me for a review of their tortilla chips. They sent some samples of their chips in three different flavors: Lightly Salted, Black Bean and Cheese, and Squeeze of Lime. Corazonas are different from the other tortillas available on the market because they are infused with cholesterol-lowering plant sterols (over 140 clinical studies show that plant sterols may help naturally reduce cholesterol when consumed at beneficial amounts). I’m normally not very keen on snacking but Corazonas’ health claims spiked my curiosity, thus I decided to give it a-go. I tried all the flavors and my favorite was (by far) the Black Bean and cheese. 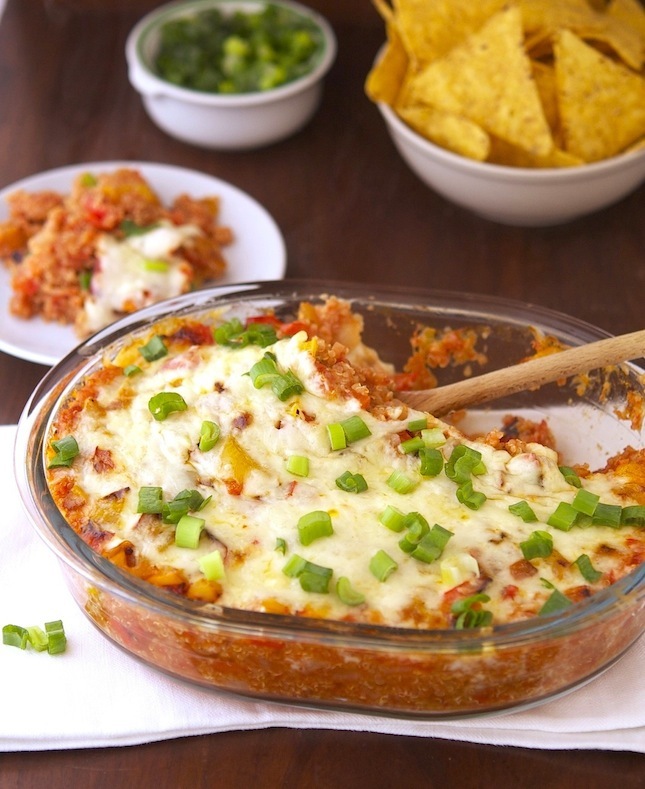 They also proved to be the perfect companions for this quinoa casserole. If you are interested in giving them a try head on over to their website. I’m showing you my hand dipping a Corazonas Black Bean and Cheese chip into this yummy mountain of Spicy Mexican Quinoa Casserole goodness, you won’t be disappointed with this combo. 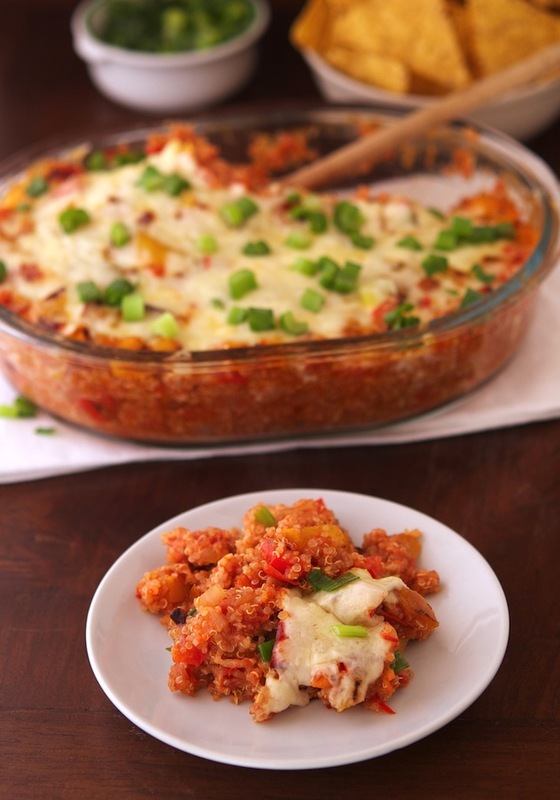 Spicy Mexican Quinoa Casserole Print this recipe! Preheat oven to 375°F (190°C) and lightly grease a 8x8 baking dish. In a skillet over medium heat add oil, garlic and onion. Saute’ for about 3 minutes. Add chopped tomato, tomato sauce, red pepper flakes, jalapenos, salt and pepper. Stir and let simmer on low heat for 7 minutes. In a dry nonstick skillet over medium high heat, toss and toast quinoa with cayenne pepper, chili powder and cumin for 2 minutes. Taste and season with salt. Set aside. In the same skillet over medium-high heat, place the diced peppers and DO NOT stir. This allows the peppers to get the brown roasted look on the outside. Wait for 2 to 3 minutes before stirring, then let them roast for another 2 minutes before removing from the heat. Set aside. 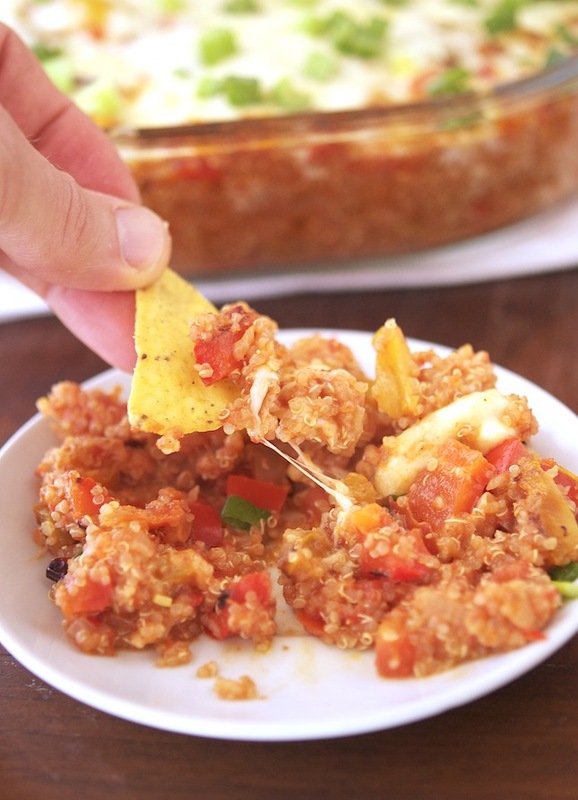 In a large bowl combine tomato mixture, quinoa, ½ of the shredded cheese and ½ of the bell peppers. Transfer quinoa mixture to baking dish, top with remaining bell peppers and cheese. Cover with foil and bake for 20 minutes. Remove foil and bake for another 10 minutes. Serve with tortilla chips, salad, sour cream or just eat it plain. One serving yields 247 calories, 12 grams of fat, 26 grams of carbs and 11 grams of protein. This looks delicious! It's a great Meatless Monday idea! Made this last night: soooooooo yummy! So delicious! I am enjoying it right now. I'm browsing your website non stop. Thanks to Food Gawker, that I landed here. Quinoa is our favorite. Can't wait to try this casserole recipe. Thank you Madhuram! This casserole has become one of my fave dish lately. I've been making it at least once a week. This recipe is so delish! Made it last night and going to have it again for a post run snack! Do you know if this freezes well? I'm looking for healthy freezer meals and this sure looks delish. It should freeze pretty well. I haven't tried it though so I can't really tell. This may be a silly question, but do I start with 2 cups cooked or 1 cup raw quinoa with toasting in the skillet? I am new to quinoa but this meal looks super yummy, can not wait to try. You start with the cooked quinoa and you toast it in the skillet with the spices. I just mentioned between parentheses that you need about 1 cup of uncooked quinoa to get 2 cups of cooked quinoa. I'm sorry if that is a little unclear. That's awesome Christina. I love how you tweaked the recipe to make it your own! Have made this twice in the last 2 weeks. Everyone loves this! So easy and so tasty!! Suggestions for substitutes to make this non spicy? I didn't want to just omit the spices but rather substitute. I would love to try this with my fussy preschooler! I made this last week for my 10-year old niece, I used only cumin and just a (very small) pinch of chili powder (no cayenne or red pepper flakes). It lacked the heat but was still packed with flavors. I hope your fussy preschooler will love it as much as my niece did! Amazing! I added 1c corn and 1 can rinsed black beans as they were on hand - a wonderful addition. Thanks for the recipe! That's great Dawn, corn and black beans sound like a great addition! I had to pop in and say I made this for dinner yesterday. It was really good. I do a lot of healthy recipes and the success of yumminess in them can be lower than there full fat cousins, but this was a dish that stands up to those in flavor. I'll be making it again. I also thought black beans would be a nice addition, and corn sounds good too. My man suggested pulled pork though, of course that would change the nutritional content :-) I'm sure ground beed, shredded chicken or pork would be good though for anyone that feels they need to have some meat. This seems very adaptable to whatever suits someones fancy. I made a double batch to freeze one for sometime when I'm not prepared to cook and I'm really glad I did! We topped ours with a bit of low fat sour cream which was a good addition. I'm excited to try your eggplant parm with quinoa soon, espeacially now that this similar dish was such a hit. Thanks for the great recipe! That's awesome, I'm stoked that you enjoyed it that much! I went to make this tonight but we didn't have peppers or Mexican cheese. Boo! But then, a flash of genius when looking at the Greek quinoa patties recipe: made the casserole with kalamata olives, capers, zucchini, and feta, and it was amazing! Thanks for the great idea! I do love my food to be spicy, I'll concede that. But if you're not a big fan of it it's a good idea to dial it down a notch. And btw, I loooove gouda cheese. Unfortunately we don't get very good gouda 'round here, Certainly not those amazing ones with herbs and spices you can buy at the Farmer's market in Amsterdam: SO GOOD! Love your website! If I didn't have a cold today, I'd be making this... looks delicious! Thanks! Putting some quinoa out to soak right now! Think this will be a great way to finish up my leftover turkey. That's awesome, let me know how you like it! I left out the peppers and added some corn (small can) to the mix before putting it into the oven - makes it extra creamy! That's awesome Ramona, I'm not a big fan of corn myself but it seems like a lot of people are adding it to this casserole and loving it! I really like the recipe I will try it. I would however like to know what "1 serving" is we have the number of calories etc. but how much of the product is a serving? Just made this, brought it into the office and everyone loved it! Thanks! Just made this and it was delicious!! I added some extra kale that I had as well. Will definitely be making this again. Thank you for the fantastic recipe!! Question: What is the sodium content for this... really have to watch that. I went out and bought the items to make this. Considered how I can tweak it so I can still have some heat yet the rest of the family will eat it. Only to finally have the light bulb come on telling me I have no idea how to cook this quinoa. From looking it up I have seen simple to elaborate steps to ensure the texture is just right. What do you suggest? Also one of my thoughts to change is using chipotle powder instead of chili powder at some point. I suppose the first step is deciding if I even like quinoa before trying to play chef and alter it. Personally I wash thoroughly the quinoa then cook 1 cup quinoa, with 2 cups of water. Bring to a gently simmer, cover and cook for 15 minutes. After 15 minutes, turn off the heat and remove the pot from the burner. Let stand for 5 minutes, covered.Then remove the lid, and gently fluff with a fork. Sounds good? As for the spices, do play around, it rarely disappoint! Great dish! Can't wait to make it again. Glorious casserole last night: no prisoners, no leftovers! 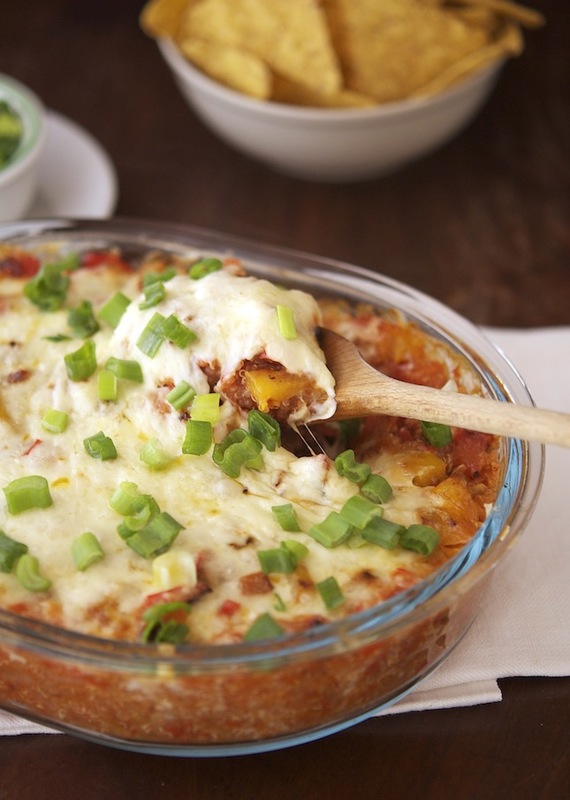 I make this casserole quite often and it is a huge hit in my house. I do add 1 can of black beans, some frozen corn, and occasionally sliced black olives. What I'm wondering is can this be made ahead and then frozen? Has anyone done this and had success reheating it? Do you need to thaw it before baking?